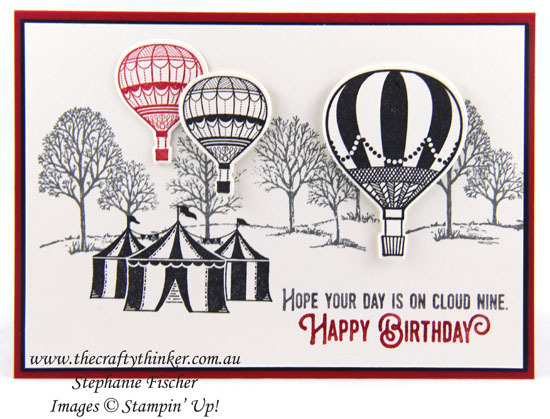 Welcome to the Crazy Crafters' Blog Hop with our Special Guest stamper, Sandi MacIver - we are thrilled to have Sandi join us this month and so excited to CASE (Copy And Selectively Edit) any project that has been created by her . This is Sandi's card that I have chosen to CASE. I just love the Lift Me Up bundle, so I couldn't resist this card! I was also inspired by a lovely Christmas present from my Brother-in-Law: a gorgeous mug in black and white with the London skyline (I can even pick out the Gherkin!). There's a tiny bit of red in the form of a telephone box - a detail that I love! Attached to the handle of the mug was this great tag - and that made it even more special! 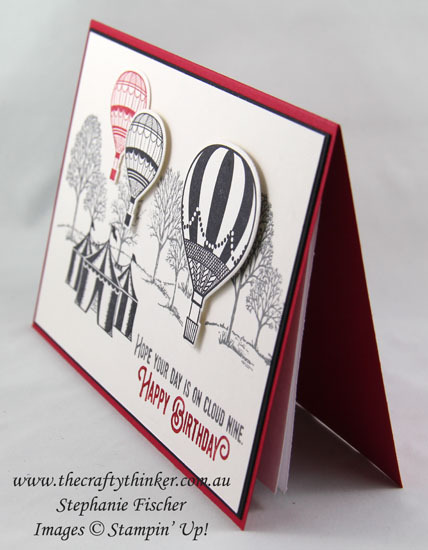 So, clearly, I was going to make a card with balloons in black and white with a touch of red! I decided to make a little scene with the tents from the Carousel Birthday stamp set and my all time favourite stamp set - Lovely As A Tree, which I stamped in Basic Gray to set it back a bit in the scene. 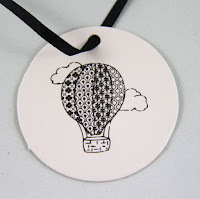 I stamped the balloons from the Lift Me Up stamp set and cut them out with the matching dies from the Up and Away Thinlits which I bought as the bundle and saved 10%. The greeting is also from the Carousel Birthday stamp set. I used markers to ink up each line of the greeting separately in Basic Gray and Real Red.